So quite a few things have been brewing in the cryptospace since my last entry since we last spoke. Firstly the overall marketcap of the cryptosphere has continued to decrease and Bitcoin dominance has grown to 54%. There seems to be waves of FUD across all platforms as this downturn in the market causes people to become anxious. EOS has seen more of a fluctuation than other coins in price but this bear market is an opportunity for core progress and development of the ecosystem than making speculative gains. Ripple (XRP) has comfortably remained in the #2 in terms of marketcap and both camps are very vocal about the “Rippening” and envision it replacing bitcoin. I see this as unlikely but maybe this time next year I could be wrong. Ripple has perked by interest and my idiots guide of understanding its purpose it is bring blockchain technology to the banking world. It intends to interrupt and replace Swift the current system used global by the banking industry to connect transactions and wealth exchange. At present EOS holds the record for most active blockchain with an average of 45 million transactions recorded in 24 hours. This is amazing achievement not just for EOS but for the face of blockchain technology and shows what blockchain is capable of doing and where it going to head in the future. The value of BTC flirts around four thousand mark with rises and falls but it is trying to find some kind of new resilience at these values. If faith in the market remains to hold this value for a considerable period of time, we can all cautiously hope that December ends the year on a little bit of stability. Optimism is always risky but we all hope for a sunny day even in the winter. So EOS has had positive news in terms of hitting in excess of 45 million daily actions on the network, but has been plagued these last few days with FUD in response to some comments on telegram made by Dan Larimer. It prompted in the end a medium post from him with his continued assurance that he has no intentions of leaving EOSIO and Block.One and that there are still big plans for the future. We also learnt that the company has grown in size and staffing, “the Block.one engineering team, which has now grown to nearly 100 engineers, and continues to expand rapidly. ” Lots of people were skeptical that the ICO war chest would line founders pockets but it appears a healthy ecosystem of the business. As it hires more hands on deck for new ideas and features are being invested in, we can only wait for there implementation. A common theme of FUD is where are all the things Block.One promised, wallets, REX etc. I think the internet community as a subculture are an impatient lot and we expect things now. The goal and movements forward are for them still to deliver what they promised. “As we prepare to release the next layer of infrastructure for developers and consumers to leverage Blockchain capabilities with EOSIO”. I have been waiting 3 years for Star Citizen progress, I think I can grin and bare this for EOSIO. It is also of note that Chintai has begun using its voting power to influence the Block Producers and some of the order of top 21 and standby have changed around. Chintai declared its intentions a week or so ago here, and it went into effect on the 3rd of Dec. This attention has been news worthy and mentions of voting and BP changes will hopeful prompt idol account holders to refresh their votes, as vote engagement is key to any DPOS network success. Chintai plan to release a more detailed report in 48hrs after this post of who they voted for and why. 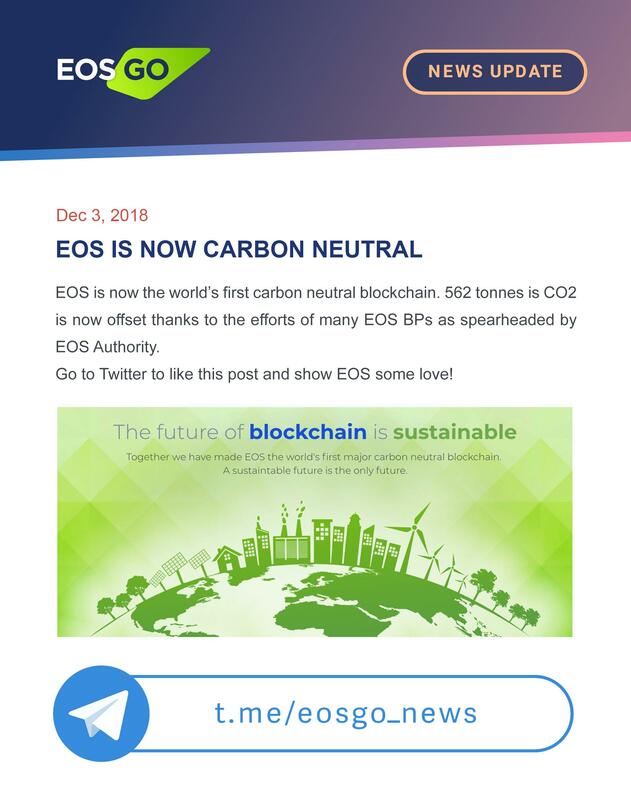 To end on a brighter note, EOS has the claim that it is now a Carbon Neutral blockchain. A common theme of traditional media outlets is that cryptocurrency uses vast amounts of energy, which POW do and so does all kind of current existing financial systems. However this neutral status will help combat this FUD and help to promote green initiatives in the blockchain space. Now I am marketing myself on here as Small Time Investor and one of my biggest gains has been through my engagement here on Trybe. I have been posting articles since last month and have been a member for a few more. Unlike Steemit which I came across way to late, I had a long time until I even was granted an account and seemed that the audience was saturated and too difficult a barrier of entry. Steemit news of late regarding staff layoffs and ill spending of funds it seems a place to avoid. Maybe some of this traffic may end up here on this platform. Trybe at it’s foundations has learnt a lot from Steemit and the whitepaper for this project talks about how and why they created this platform. But as a way of generating additional tokens and use/growth of EOS network I would highly recommend engagement with this platform for your own gains, surely there is something you could write about? The recent update clearly has taken on-board feedback from users and the UI improvements with personal profile and management of messages is on the right track. The first airdrop to 500 Trybe coin holders went well (I received my rewards) and I am looking forward to the Dec 11th Airdrop going smoothly too. The addition of wallets and vital EOS data while remaining on the site is also a great benefit too. The vast array of topics means that people can contribute and impart knowledge, and gives the opportunity to start creating a stack of Trybe as a little guy who can’t afford to pile into the pre-sale or free up other assets. Anyone can find a niche or passion that could write about and the community is very open and engaging, discord and telegram are full of people willing to engage. I have great hope for this platform and as small time investor it is really helping me expand my portfolio and footprint in the cryptospace. As always when I discuss these gambling apps, I always start with this word of caution, gambling is addictive and you can lose it all. Remember to only wager what you are willing to lose. The casino model is one of the most profitable businesses out there for a reason. EOSBET one of the first of the gambling apps to appear have earned “an official certification from on of the world’s oldest and reputable gambling regulator, Curacao Gaming“. This regulator has a Master Licence issued by the Government of Curacao, and has been recognized since 1998. This is a big leap forward for the casino and gambling sector of EOS. I hope this starts to become the standard and other EOS gambling dapps seek this and other types of validation. For wider adoption of blockchain the existing rule book is going to have be used and in order for this technology to integrate itself into this gambling space. EOSBET is one of the weaker players in my opinion but this legality might lead to new growth, it has it’s own token BET but you can only collect dividends there are not tradable or stakeable like some of the competing Gambling Dapps. With regards to staking Royal Online Vegas (formerly My EOS Vegas), has introduced a new variation of the staking mechanic. They have there own token MEV which allows staking to be now only be done on weekends to gain dividends. You can stake during the week but they are not counted to your entitlement of the pool now are they added to you stake until the weekend. This is a really interesting way of offering dividends, exclusivity is a key aspect of desire and will increase demand for the MEV tokens. The tokens have also appeared on the Bancor exchange as a newer listing, which is only a positive sign for the acceptance of Royal Online Vegas being a real contender in this gambling dApp space. I still think that the market will stay at current levels and hopefully move sideways rather than dropping further down. I do not want the price to cause successful and innovative BP’s to fail. I am still trying to fill my bags at these low prices but I am seeing this bear market as a real push for developers to improve core infrastructure and utility of the blockchain space. It will be very interesting to see how this year ends and 2019 begins! Wide-ranging and informative post @dukefish. Good overview of Trybe at is stands and the potential it offers. Cheers. Thanks for reading. Yeah I am really hopeful that the trybe platform is going to do well and become a really vibrant active community! Engagement is key imo – not just dropping posts but actually reading the posts of others and fostering a discourse, especially in crypto terms. Cheers. Indeed, forming a community and networking is vital for trybe to thrive. I did some digging around it appears that despite the small convenient status of this tax haven paradise, the accreditation as a gambling authority is valid. Many big online casinos and gambling platforms hold this document. So it is still a positive step in the right direction for the legality of emerging Gambling Dapps. agreed with all. trybe is consistently updating unlike steemit . as you said i hope the token price dosent stay low for to long for the BP’s sake. Yeah Trybe is only going to grow, I am pleased to be part of it! Another great addition to your series! Thank you, just happy people are interested in my ramblings!